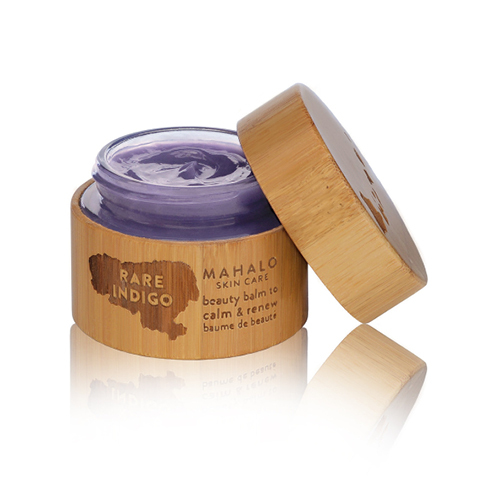 The ultimate balm to create a feeling of calm, every ingredient in The Rare Indigo Beauty Balm by Mahalo Skin Care was selected to offer a nurturing, healthy feel to the skin and senses. Rich in organic and wild-crafted rare botanicals, extracted and blended by hand, it's safe to say that this balm is the ultimate delicacy for most-to-all skin types and conditions. The aromatic complexity of this artfully crafted green beauty lends a quieting quality to the nervous system and brings a soothing sensation to the overactive and restless mind. The healing effects of this Mahalo Skin Care beauty balm come from the carefully formulated long list of organic Superpower Ingredients that includes – only to name a few – Açai, Rose, Carrot Seed, Chamomile, Helichrysum, Kukui, Muru Muru, Rose and Yarrow. But it's the unmistakeable aroma of The Rare Indigo that we can't soon get enough of and that make it a truly rare sensory experience. Use balm AM or PM as desired. For the face, smooth about a 1/2 or 1/3 pea size of balm between your palms and fingertips and press palms together to melt the balm. Press palms firmly all over face for 40-60 seconds to warm balm and help it spread onto skin. Pat an extra drop under eyes to soften the appearance of wrinkles and scars, and soothe the appearance of puffiness and dark circles. Allow balm to remain on skin for 5 – 10 minutes before applying serum, sunscreen or make-up. Apply on the décolleté area AM and PM as desired. Warm a 1/2 pea size of the balm between the palms and press along the collar bone line and neck, breathe deeply. 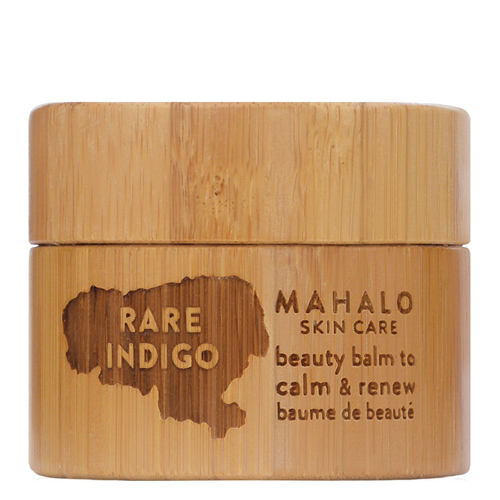 The fragrant and transporting aroma of The Rare Indigo Beauty Balm will invoke a sense of calm when applied. It is especially effective before meditation, a busy day or at bed time. I did not think moisturizing balms were for me. They usually feel thick to spread and leave too much residue on the face for comfort (or for a good complexion--anything too occlusive gives me pimples). I got this as a Love More promotion. I am always curious about Mahalo products but generally nervous to try them blind due to cost. (I shouldn't be, I have never been disappointed.) At first, I was nervous about the scent. I have felt this way with other Mahalo products. It is potent, and sweet. I usually can't handle strong sweet fragrance on my face, but this one was compelling. As with the Petal and the Unveil, I have come to love it. The texture of the balm is wonderful. It melts easily, spreads with ease, and absorbs into the skin, leaving it soft and hydrated with little residue. I love that this has no shea butter, which always makes me break out. It is a true multipurpose product. I used it at the beach in the heat of summer, and in the below-freezing winds of the midwest winter. It is always delightful. I suffer from perpetually pink cheeks, and I find that this helps them look and feel less irritated. Highly recommended! I wanted so badly to try this product, when it was offered as the Love More gift, I placed an order to get this. It is hard; I had to use the back of my fingernail to scrape some to use. The scent is nice and it hydrates well. It doesn't feel luxurious to use because of the texture. I would not buy this product, though I am glad I finally did try it. can't stop won't stop (using this)! This is my top skincare product; I can't be without it! I have sensitive dry/combo skin, flush easily, and have to be careful what to use in order to not irritate my face. This balm is just so lovely and soothing - it presses into my skin wonderfully, deeply moisturizes my super dry cheeks, and yet doesn't break out my t-zone. I'm a product junkie so can't help trying new things, but every time I use something else I just keep wishing I was wearing this instead! If anything irritates my skin, this is my go-to in order to recover. I put this on the morning of my wedding, and my makeup artist complimented me on my face's moisture level - said it was perfect for her to work from (earlier in a trial she'd noted my dry skin - but the rare indigo solved that!). This is my absolute favorite discovery and I've been a sidekick now for two years. It's so pretty, the wooden jar is a pleasure - it feels and sounds so intentionally luxurious, practical and satisfying - and of course the fragrance... I really could eat this. My skin is fair, easily irritated, clog prone, often oily but thankfully nearly without lines or wrinkles at 38. Typically, I'm only prone to breakouts when I use pigmented products (read: foundation or blush), sunscreen (all but powder) and some oils (coconut, mangosteen, chia, broccoli seed, rosehip, and some others). What I mean is, I know what to avoid, but I don't always know what to use. Due to the price of Rare Indigo, I've been trying other things with some of the ingredients, hoping to find an alternative. There just isn't one. On hot, polluted summer days, nothing ferls better than coming home, taking off my mineral powder sunscreen and mascara, misting my face with thermal water and pressing this into my fussy, tired skin. I'm always thankful when I use it because I wake up to a clear and calm complexion. Now, if only I could find something to prevent the sensitivity to begin with...?